Period : 08.30 - 15.30 hrs. 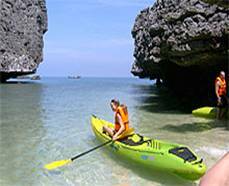 The Coral Island, locally called Koh Tan, is a primitive tranquil island and spans an area is 7.5 square kilometers. The island is considered to be the neighboring island of Koh Samui. On the island lies a small pristine village and there is neither car nor road. The island, surrounded by coral reef with serene white sandy beaches, offers a perfect spot for snorkeling and sun-bathing. One of the best places for snorkeling is Coral Island. Pick up from your booked hotel/resort by air-conditioned minibus and a in a short while, you reach the landing stage and departure by long tailed boats to Coral Island, only a mere half an hour boat trip. After a short break for a coffee, boats will take you to admire the wonderful coral formation that surrounds the place and further on to Koh Matsum, a small Island with a white sandy beach. Lunch will be served on Coral Island. The rest of the time is just at leisure and make use of this opportunity to see the underwater world via your snorkel mask. 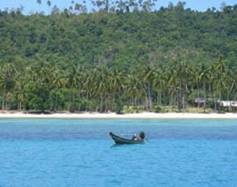 The Coral Island, locally called Koh Tan, is a primitive tranquil island which takes about 20 minutes by long tail boat. Its area is 7.5 square kilometer and is considered as the neighboring island of Koh Samui. On the island lies a small pristine village and there is neither car nor road. The island, surrounded by coral reef with serene white sandy beaches, offers a perfect spot for snorkeling and sun-bathing. According to the superstitious belief, the dog is unable to reside on the island due to the forbidden supernatural power. If a dog steps on Koh Tan, it will be wailing howl and run around until it dies. 09:00 hrs. Embark at the pier jetty to "Koh Taen" in half hour, Stop at restaurant where we will serve coffee or tea. Then change your clothes for snorkeling, we'll take you to snorkeling around Koh Taen to enjoy the coral reef for about two hours. 12:00 hrs Returen to Koh Mudsum for lunch Thai food buffet style, and fresh fruit in season is also served, Then you can relax or sighseeing on the white sanded beach of Koh Mudsum, and snorkeling near the beach will be available at this time. 15:30hrs. Arrive at the pier and transfer to your hotel.